"David Nour's work on helping Associations think and behave more innovative and forward thinking was very aligned with our vision for the next generation of AAO members," said Chris Vranas, CAE, AAO Executive Director. 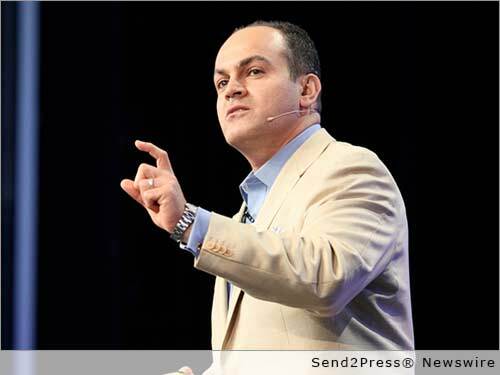 MIAMI, Fla., Feb. 3, 2015 (SEND2PRESS NEWSWIRE) — David Nour, enterprise growth strategist, and best-selling author of Relationship Economics® and Return on Impact®, will be leading the American Association of Orthodontists (AAO) at their 2015 Emerging Leader Conference on February 5, 2015 at the Loews South Beach Resort in Miami, Florida. David Nour, CEO and Founder of The Nour Group, Inc., is an enterprise growth strategist and the thought leader on Relationship Economics® — the quantifiable value of business relationships. He advises global leaders and boards of corporations, associations, and academic forums on disruptive innovations to fuel their growth. In a global economy that is becoming increasingly disconnected, The Nour Group, Inc. has attracted consulting engagements from over 100 marquee organizations in driving unprecedented growth through unique return on their strategic relationships. David Nour has pioneered the phenomenon that relationships are the greatest off balance sheet asset any organizations possesses, large and small, public and private. In his role as the key note speaker of the AAO 2015 Emerging Leaders Conference, David will lead a discussion on how to develop a digital strategy and will introduce its attendees to the 10 Relationship Impact® Moments, on- and off-line, to help to engage and influence others. In addition, The Nour Group will design, develop, and deliver a series of six one-hour follow-up Return on Impact® Webinars that will help attendees and emerging leaders in the industry to implement digital strategies to grow and advance their orthodontic practices to the next level. “David Nour’s work on helping Associations think and behave more innovative and forward thinking was very aligned with our vision for the next generation of AAO members,” said Chris Vranas, CAE, AAO Executive Director. “From our initial due diligence call with David, we felt very comfortable that his style of candor, provocative, contrarian approach would be an ideal fit with members we need to carry the baton forward in our Association’s rich history and evolution,” added Dr. Brent Larson, Board Member and Conference Committee Chair. “I’m excited to work with visionary association executives like Chris Vranas and the AAO Board. Every association executive understands that the evolution of their organization will heavily depend on the engagement of both current as well as next generation of members – who will demand a very different value proposition than their colleagues a decade or more ago,” said David Nour. “Return on Impact®, is about thinking and leading very differently in the age of connected relationships, and the AAO Emerging Leader Conference is the perfect forum to help them get involved in the transition of thought and practice leadership in the association,” Nour added. The Nour Group, Inc. advises global leaders and boards of corporations, associations, and academic forums on disruptive innovations to fuel their growth. Founded in 2002 by global business advisor, international speaker and best-selling author of Relationship Economics®, David Nour, the Nour Group has attracted clients including KPMG, Siemens, Disney, IBM, Gen Re, Amerinet and over a hundred other marquee organizations in the evolution of their business models. The firm’s services range from strategic advisory, keynote speaking and facilitation of executive discussions, to training and development, coaching and mentoring, all aimed at fueling personal, team-based and organization-wide growth through the art and science of business relationships. To learn more about Relationship Economics®, or how The Nour Group, and its founder, David Nour can help your organization reach its relationship networking potential, visit http://www.nourgroup.com/ – or contact Stacey Doyle at 888-339-1333. The American Association of Orthodontists (AAO) is a professional organization of 17,000 member orthodontists in the United States, Canada and abroad. Orthodontists are uniquely qualified to correct improperly aligned teeth and jaws. They are specialists in the diagnosis, prevention and treatment of dental and facial irregularities. Orthodontists receive an additional two-to-three years of specialized education beyond dental school in an accredited orthodontic residency program to learn the proper way to align and straighten teeth. Only those who have successfully completed this formal education may call themselves “orthodontists,” and only orthodontists are eligible for membership in the AAO. Visit http://www.mylifemysmile.org/ for information about orthodontists, orthodontic care and to find an AAO-member orthodontist near you. *PHOTO for media: Send2Press.com/wire/images/15-0203-david-nour-300dpi.jpg . *Photo Caption: David Nour, CEO, The Nour Group, Inc.
News issued by: The Nour Group, Inc. Original Keywords: The Nour Group, Inc. Miami Florida MIAMI, Fla.
News Source: The Nour Group, Inc.
More from The Nour Group, Inc.
RSS News Feed for The Nour Group, Inc.
REFERENCES: Advertising and Marketing News, The Nour Group, Inc. Miami Florida MIAMI, Fla.